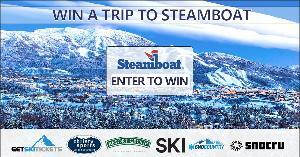 Prize: $1,000 airfare credit; 4 night stay in Steamboat at the Trappuer’s Crossing Resort; ground transportation; 2 sets of demo ski / board rentals provided by Christy Sports, including boots, poles and helmets ($3,500). Statistics: This contest was opened by 160 and entered by 18 ContestChest.com members. 11% of those who opened the contest, entered it.